The innocence and vibrancy of youth rang out from containment in the west to all points beyond as students of Dalton E. Tucker went to the Sandys Maxi Mart parking lot in peaceful and reverent respect to a pioneer, freedom fighter, activist, and legend in the battle for equality, Dr. Martin Luther King Jr. Combining in song traditional mantras of the oppressed, along with prose specific to Dr. King in his role as a proponent of non-violence and equality among all races and in all nations, the area was transformed to a scene of harmonic celebration, with spectators and passers by taking interest and even singing along. Teacher and leader of the band Tajuana Dean explained the event as being the latest in an ongoing initiative to honour the life and memory of Dr. King and his impact on the world. “This is an annual event at Dalton E. Tucker school where we commemorate the life and legacy of Dr. Martin Luther King. We’ve often walked from the school to Maxi Mart, sing a few spiritual songs and return,” noted Ms. Dean, who appeared as enthused as her bright-eyed charges in her role directing the affair along with fellow educators at the school. Members of the school body were, prior to the parking lot adventure, treated to an address by local and living activist in the Universal Suffrage movement embarked on by the Progressive Group [PG] during the 1950s and 1960s, Ms. Florence Maxwell, who, along with fellow PG member and friend Edwena Smith, began intensely focusing on establishing voting rights, and would soon also involve others such as Dr. Roosevelt Brown and form into the Committee for Universal Suffrage with Roosevelt as Chairman and initiated an organised campaign, which is credited as a success in leading the island toward greater voting rights and equality among all Bermudians. “Mrs. Maxwell came to make a connection between Dr. Martin Luther King and what he stood for and what the Progressive Group that organised the secret boycott of the theatres back in the sixties,” added Ms. Dean. “So we had a nice assembly which the students enjoyed and then we started walking and singing. Further asked to the value of the message to local youth, the instructor exclaimed the importance of learning items in the historical context in a manner that brings relevance to today. There was a quick-march retreat to the school grounds following the event. Very nice, and when they get older they will get a taste of reality of what the occasion is about. Nice but why we don’t teach the children their own heros, right here in Bermuda, like Dr.E.F. Gordon, whose work was quite similar to Dr. King. No disrespect meant, but it is sad that our children don’t even know the people that made sacrifices for them in history and it happened all here in Bermuda. 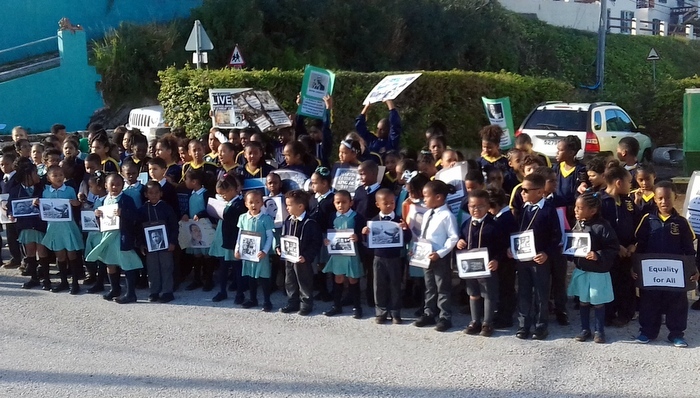 Such a cop out to teach children who have no adults in Bermuda recognising this as a memorial in any type of way. Why do they teach our children about Martin Luther king and not the adults! What is the significance going to do for them ? Where are any adults in Bermuda holding up placards, and Dalton Tucker stood solely on the prinicples of the Bible which she read daily! That’s what Dalton E Tucker was about! The teachings of the bible, everyday! So why name a school after a woman who was strong in the word of God, and teach about an American hero ?